REAL is a Marie Curie Actions Innovative Training Network (ITN) funded by the European Commission under the Seventh Framework Programme. The project involves seven full participant research centers in Europe and nine international associate partners and has been running since 2013. The aim of REAL is to provide a longer-term historical perspective on human-environment interactions to enable future long-term sustainable use of East Africa’s fragile environment and resources. Together we will focus on the temporal, spatial, and social dynamics of human-landscape interactions in East Africa over the last millennium. 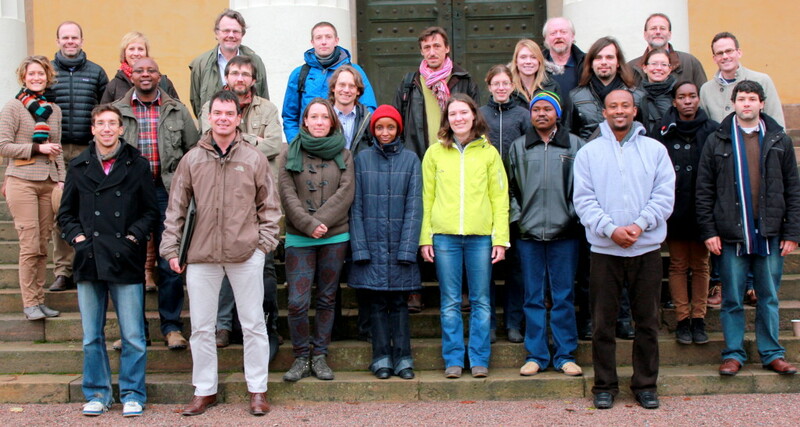 REAL members, November 2013, Uppsala University, Sweden. The strong temporal dynamics of the East African landscape and natural-resource distributions have always encouraged people to innovate and adapt to changing conditions. However, the realities of current social and environmental changes are occurring at unprecedented rates and amplitudes. Increasing population growth, changes in patterns of land tenure, industrialization, weak systems of governance, and global climate change have exacerbated previously localized environmental problems such as soil erosion, water depletion, loss of forests and grazing land, falling soil fertility and biodiversity. Novel approaches for resolving these challenges are thus urgently needed. Based on the premise that the past is the key to understanding the present and planning for the future, this project will establish a leading European training network devoted to combining state-of-the-art-research methods to tap into under-appreciated knowledge of how indigenous peoples have previously adapted to East Africa’s intrinsically variable climate and land/water resources. By bringing together ecologists, archaeologists, anthropologists, geographers, historians and agronomists, the ITN will provide cross-disciplinary training to a new generation of researchers, enabling them to interpret data relating to past and present socio-cultural and ecological dynamics from across the environmental and social sciences and the humanities. Organized by researchers from seven European universities in partnership with private actors, the ITN will cooperate closely with academic counterparts, private-sector stakeholders, NGOs and local communities in East Africa. It will highlight how detailed awareness of the complex history of human-environment interaction in East Africa is central to well-founded and ecologically sustainable resource management. This will be useful for restoring the important functions of indigenous know-how crucial for devising development policies and climate-risk management for specific regions and train a new generation of future ecosystem-service managers, policy makers and entrepreneurs. The REAL ITN consists of three research work packages (WP2-4), and two cross-cutting work packages dedicated respectively to management and training (WP1), and dissemination and capacity building (WP5). The entire ITN comprises twelve Early Stage Researcher (ESR) and two Experienced Researcher (ER) projects, split between seven research institutions. These are Uppsala University, the University of York, Stockholm University, the University of Cologne, Warwick University, Ghent University and EHESS University of Paris I. The different projects will fill knowledge and methodological gaps and embody REAL’s inter-sectoral and interdisciplinary nature. The research work packages are structured around three temporal foci: the more distant past of the last millennium (ca. Common Era [CE] 900-1930), the more recent past and present (ca. CE 1930-2012), and the future (ca. CE 2012-2100). Results will be disseminated through a series of academic papers, workshops and conferences; doctoral dissertations; meetings and workshops with stakeholders and policy makers; local radio programmes; the project website and social media. The REAL ITN Partners and Associate Partners strongly believe that planning for the long-term sustainable use of East Africa’s fragile environments with multiple stakeholders requires a longer-term historical perspective on human-environment interactions than is currently available.. The individual research projects and the network training to be undertaken as part of the REAL ITN have thus been designed to focus on the temporal, spatial and social aspects of this history. Some specific regions of East Africa are focused upon to build upon previous work by project partners and related research. To create new synergies, the main geographical focus of the project will be on the Ewaso Basin and Eastern Rift Valley in central Kenya, and the Pangani Basin and Amboseli catchment in north-eastern Tanzania and south-eastern Kenya (Figure 1). These cover a range of environments, social-ecological histories and probable future trajectories and hence are ideally suited for comparative analysis and as a training environment. In particular, the strong climatic moisture-balance gradient associated with the mixed topography between the Rift Valley and adjacent uplands creates a mosaic of landscapes covering the full range of ecological and economic carrying capacity. A core consideration will be on how societies, landscapes and ecosystems have responded to climate change both currently and in the past under different conditions, so as to better understand how they may respond to future climate change. Figure 1 – Focus regions within the REAL project. 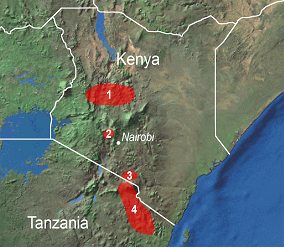 1) Laikipai and Ewaso Basin, 2) Baringo-Naivasha Basins of the Eastern Rift Valley, 3) Amboseli Basin, and 4) Kilimanjaro-Pare-Pangani Mountains. Integrate available records of past environmental change (from different sites a diverse range of indicators) to accurately document past ecosystem dynamics in East Africa. More recent ecosystem changes will be reconstructed from historical maps, aerial photographs and satellite remote-sensing data to produce high spatial and temporal reconstructions of ecosystem, land use and settlement change at the landscape scale. Develop methods to extrapolate site-scale data on past ecological and environmental conditions to the landscape scale; for example, apply models to link ecosystem distributions in the past, present and future under alternative climate-change and human-interaction scenarios; and quantify the rate and timing of ecosystem shifts due to changing population growth, migration and human-ecosystem interactions. Unravel the connection between ecosystems, livelihoods, conservation and climate change and use this knowledge to assess impacts on livelihoods in the vital economic sectors underpinned by ecosystem resource planning and policy (e.g. agriculture and tourism), both within the research area, and more generically across Africa. 1) What magnitude and spatial pattern of natural, climate-driven ecotone change has occurred in East Africa at different temporal scales over the last ca. 1500 years? 2) How much variability were East African social-ecological systems able to accommodate without reaching potentially crippling tipping points or thresholds? 3) What is the temporal scale at which climate change becomes a major driving force for societal change? 4) At what point do changes in ecological and social boundary conditions become so significant that [radical] restructuring of society is needed? 5) Which past and present adaptation and mitigation practices can fruitfully inform decision-making and governance structures to result in sustainable resource use? This project has received funding from the European Union’s Seventh Framework Programme for research, technological development and demonstration under grant agreement no 60687.